The National Football League has proved a rather difficult task for the Cleveland Browns of late. The club has a rich history in the NFL but has seemingly fallen off-pace with the rest of the pack, failing to win a single game in 2017. The 2018 regular season has come with renewed energy and spirit in the team, though they still remain rooted to the bottom of the NFL standings. 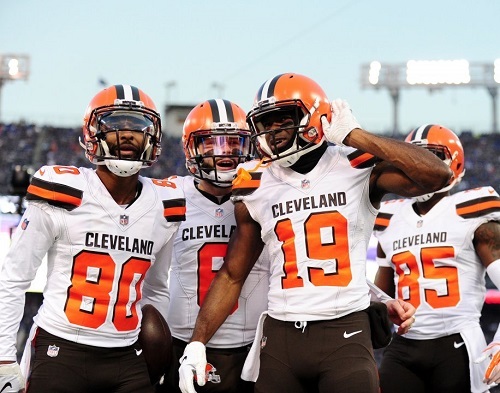 Find out how to bet on Cleveland Brown games, looking at the betting odds, stats and predictions from expert tipsters. The Ohio NFL team didnt have a great run last year, but the recent results look promising. We use the term promising cautiously, in recognition to the fact that the team went 0-16. Thus, even a single win could be viewed as a plus. The 2018 season saw shrewd business being done in regards to player signing and recruitment. In light of that, it is still early days in the rebuilding process and they look poised to miss the playoffs for yet another season. The Cleveland NFL team continue to use the First Energy Stadium for their home games since 1999 despite changing conferences. They are currently playing in the American Football Conference North division where they are finding it difficult to win. The NFL odds of many sports bookies are high for Cleveland Brown games, seemingly resigned as the underdogs. US punters are better off choosing Cleveland Browns point spread betting option. They are likely to get massive payouts predicting the correct scoreline of the games Cleveland Browns are involved in than outright bets. Take advantage of the football odds and wager at any of our recommended bookies online.